Although they are beneficial creatures in terms of controlling insect populations, most people don’t like spiders in their home. Most don’t present a danger to humans; however, there are two species of venomous spiders found in Michigan: the Brown Recluse and the Black Widow. When these species are spotted in your home, you should immediately call on a professional to safely remove them. 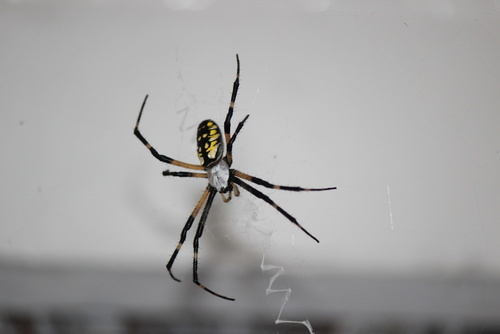 Buckmaster Pest Control has the needed industry knowledge and experience to eliminate spiders in your home, address points of entry, and deliver treatment that prevents future visits from our eight-legged friends. They are non-aggressive and won’t bite unless provoked, even venomous ones. They typically are born in the spring. Common house spiders generally live 1-2 years, but can live as long as five. Only large spiders have strong enough pincers to break human skin. Brown Recluse – not indigenous to Michigan (emigrate in trucks coming from southern U.S.) and can’t live in temperatures colder than 40 degrees. Rare, but dangerous! Immediately seek medical attention if bitten by one. Black Widow – found throughout Michigan, but especially prevalent in southwest Michigan. They are entirely black. Females will have a bright red, hourglass shaped marking on the abdomen. Males may have a red or yellow band on their back. They rarely bite, but should one bite you, immediately seek medical attention.